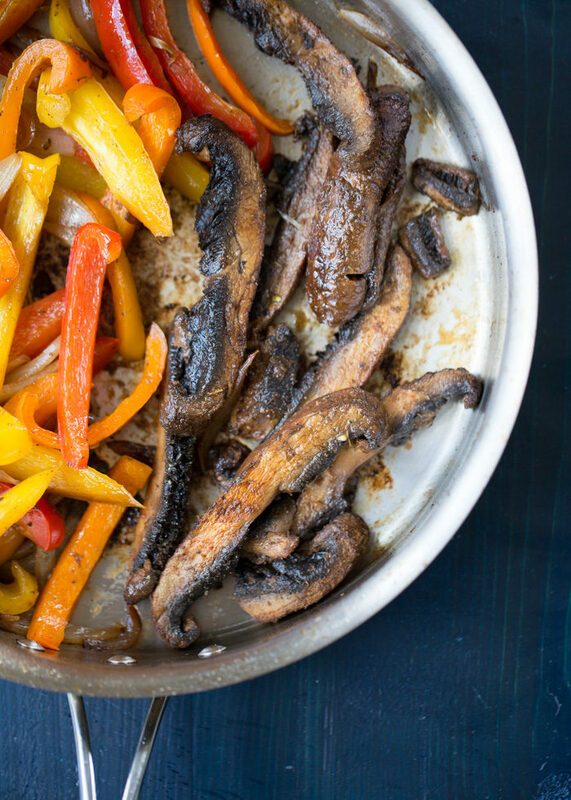 These full-of-flavor vegan fajitas are on the table in 20 minutes. Keep ’em simple or load ’em up with your favorite toppings – either way, they’re super satisfying and tasty. 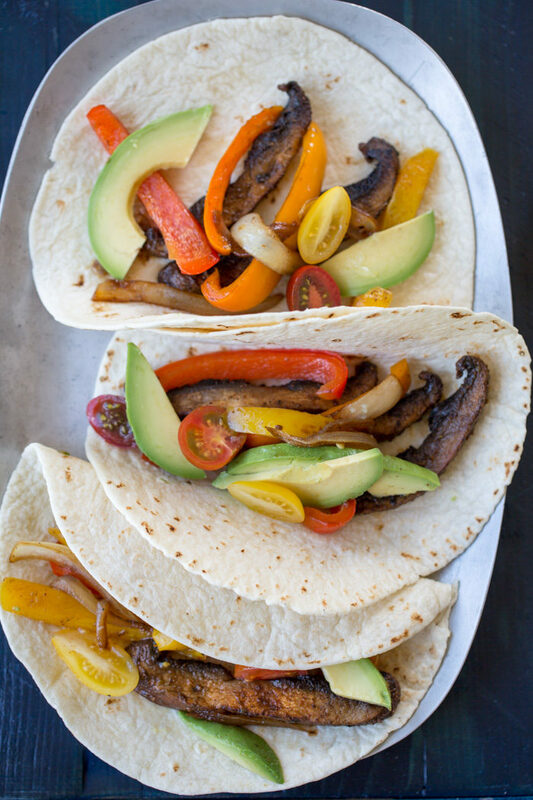 These Easy Portobello Mushroom Fajitas were going to be something way more complex – a fajita quesadilla of sorts, with a few options and a few bells and whistles. But then I took a taste of the seasoned and sautéed portobellos and after mmmmming and aahhing, I realized … the recipe stops here. In all its simple glory. Ah, fajitas. So tasty. So easy. So … well, kinda retro, aren’t they? Good thing I’m a huge believer in retro. 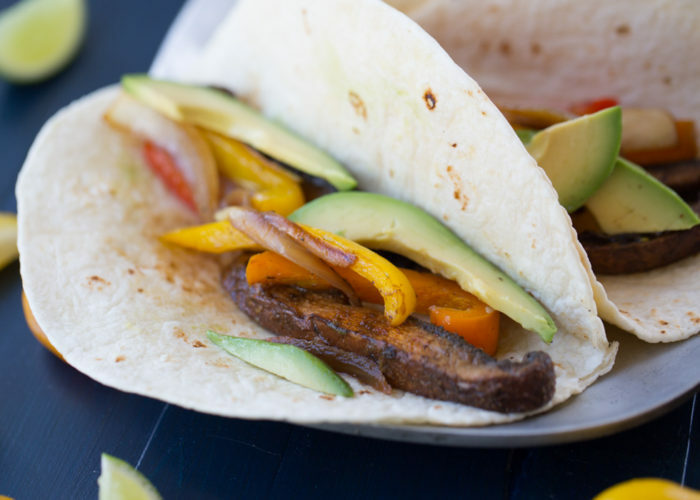 These completely plant-based fajitas come together in a flash (okay, about 20 minutes). No marinating needed, just a bit of seasoning and sautéing and slicing and voila! Dinner. So, how easy? Well, first, you wrap the tortillas in foil and plop them in the oven to get them nice and warm. Then, you slice up the portobellos and toss them with some olive oil and a bunch of spices. Saute until golden and perfect, then cook up the peppers and onions. 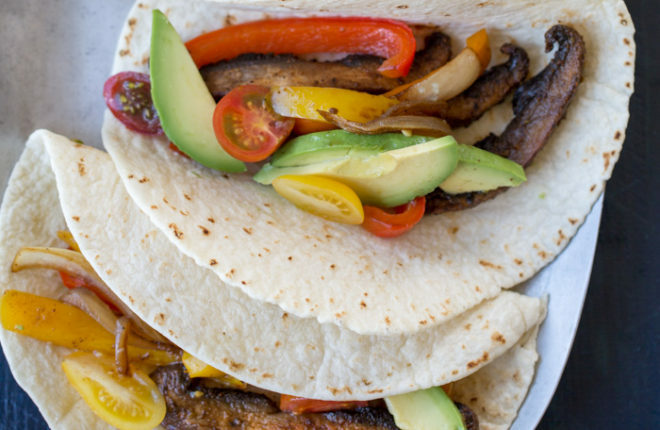 Pull those now-warm tortillas out of the oven and pile ’em up with veggies. A little avocado, a couple of cherry tomatoes, and a squeeze of lime seal the deal. Need dairy in your life? Try a bit of queso fresco if you like. Or heck, go with pepper jack for some all-the-way-retro action. Preheat oven to 250 degrees Fahrenheit. Wrap tortillas in foil and place in oven to warm. Twist the stem off of the mushrooms and wipe caps with a damp paper towel to clean. If you prefer to remove the gills, use the tip of a spoon to pry them out. 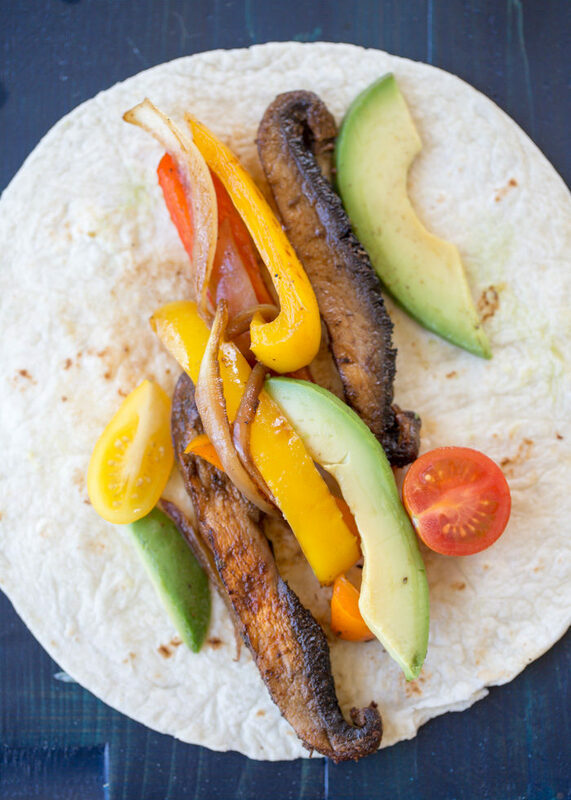 Some people like to remove the gills because they can turn the foods they’re cooking with brown, but with these fajitas, I don’t find that to be a problem. Cut caps into 1/2-inch thick slices. Place in a medium bowl and drizzle with 2 tablespoons olive oil. Sprinkle with cumin, chili powder, oregano, smoked paprika, garlic powder, and salt. Toss gently with your hands to evenly coat the mushroom pieces. Place a large skillet over medium heat. When hot, add 1 tablespoon olive oil. Add portobellos, being careful not to crowd (cook in two batches if necessary). Cook for 3-4 minutes, turning occasionally with tongs, until tender. Transfer to a plate. Add 1 tablespoon olive oil to skillet. Add onions and peppers along with a pinch of salt. Cook, tossing occasionally, until tender and browned in spots, 7-8 minutes. 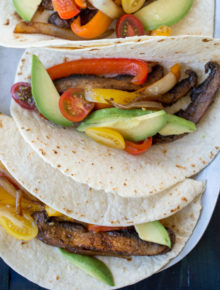 To serve, place a couple of portobello slices along with a few pieces of onions and peppers in the middle of a flour tortilla. Top with avocado and a squeeze of lime. Fold up and eat! 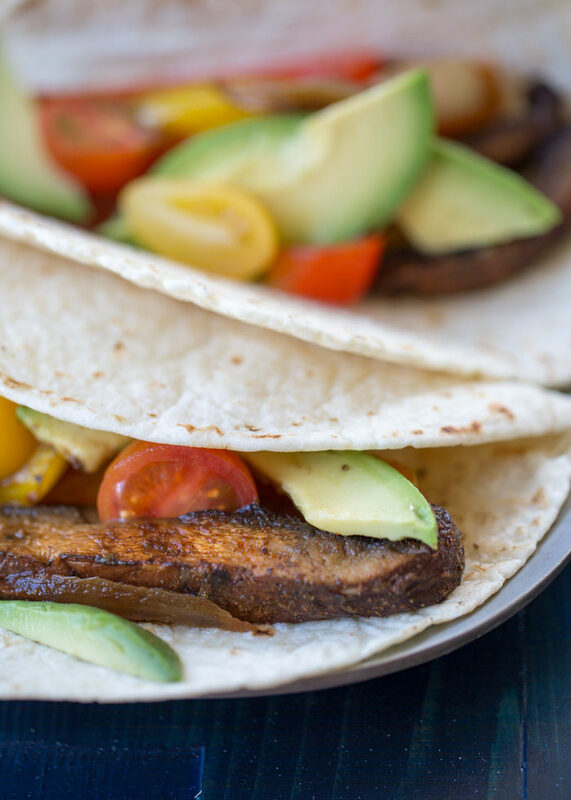 * For a completely vegan recipe, be sure to choose lard-free tortillas. Add crumbled queso fresco if you like. I was going to make fajitas and just saute the mushrooms with salt and pepper but I decided to see if there was a recipe that would make it taste better. This was the first one that showed up in my Google search, so I just went with it. I’m happy I did! The seasonings were perfect and the mushrooms taste so good!! I’m so excited for my husband to get home from work to eat these because he is going to love them too. Thanks!